Most quest followers will follow you additionally to any permanent follower. However, there are a few exceptions: The followers in the Companions questline will automatically dismiss your current follower, and Serana will require you to dismiss them in order for her to join you on a quest (except for her first one). In such cases, potential permanent followers will say that you already have a follower and be unable to join you, as the quest follower occupies the follower slot. The slot can be freed again simply by completing the quest so that your temporary quest follower leaves your service. If you ask a follower with sufficient morality to perform an illegal activity, you may be held responsible for the crime, and your bounty will increase accordingly. If you are hidden, most crimes you command your follower to commit will go unnoticed. Most followers will not interact in any way with you while you are trespassing (regardless of their morality); your follower will simply say, "You're not supposed to be in here." Fortify Carry Weight—effect works, but once unfortified limit is exceeded, only one item or stack of items can be added, then menu must be closed and reopened to add more, up to fortified limit. Followers who are also trainers can train you for "free". They will still charge you, but leave profit from training in their inventory. Simply request to see their inventory while they are an active follower, and take your gold back from any training sessions. Note that the follower's gold will reset to a low amount when you fast travel (possibly change zone), so get your money back from them quickly. The tables below list the permanent followers available in Skyrim. Once enrolled as a member of the College of Winterhold, you may recruit your fellow students to join you in your travels, if you have completed their personal quests. Simply talk to them and they'll tell you what you must do. †Version 1.0 of the Unofficial Skyrim Patch caps J'zargo's level at 30. Complete all the quests for the Dark Brotherhood to allow these followers to join you. Cicero must be spared in The Cure for Madness if you want him as a companion. These NPCs are added by the Dawnguard add-on. They become available after completing A New Order (only by siding with the Dawnguard), except for Serana, who becomes available during Prophet (both sides). For creature followers added by Dawnguard, see this section. 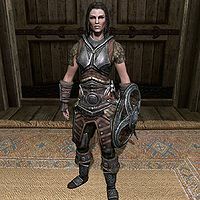 Hirelings are mercenaries; you'll need to hire them for a set price of 500 gold. They are usually found in taverns. They'll stick around until they're dismissed, at which point they'll return to their starting location and you'll need to pay the fee again to get them back. If they're particularly fond of you or you only dismissed them a short time ago, they may rejoin your service free of charge. To convince these followers to join you, you'll need to complete their quests. These pet followers are available from the Creation Club exclusively for Skyrim Special Edition. Each pet is muffled and also comes with its own spell to teleport them to your current location. Nix-HoundCC Can be found purchased from Revus Sarvani or Geldis Sadri with Nix-Hound creation. Pathfinding can make followers difficult to manage. They cannot jump up or across anything, though they will jump down if there is no other path. If you jump up a small hill, be prepared to see your follower take an extremely long path around. Quite often a follower will get stuck with no path to you. In these circumstances, it appears they are supposed to simply teleport near you, but this can take a very long time to trigger if it triggers at all. The only known guaranteed ways to get them to appear are to fast-travel, change zones (loading screen), use the moveto player console command, or to wait. Followers can and will attack your horse, summons, thralls and other temporary followers if hit by them enough. This is common when escorting a temporary mage follower, or summoning an Atronach that uses projectile spells. If you accidentally damage a follower enough to turn them hostile, casting a Pacify spell on them and rehiring will cause the follower to remain friendly to you even after the spell expires. However, initiating dialogue with your follower will immediately make them hostile again. Followers who have the archery skill and come with a starter set bow and arrows will use a single better arrow indefinitely, without using it up. Their misses and kills still show up on the ground and in the loot window and can be picked up. The single arrow may eventually disappear after an unspecified number of shots. In some instances, their standard bow may be required, but generally the follower can use any bow you choose to give. The unlimited arrow "bug" occurs with any single arrow given to the follower. A follower may not leave the recovery state even when their health is fully replenished but instead continue crawling around on the floor. This can be fixed by entering combat again with a new enemy, attacking them, fast-traveling to a new area, reloading a save, or healing them with a Restoration spell. The Unrelenting Force Shout or casting Paralyze on them sometimes works as well. Sometimes after a fight, the follower will be partially disabled, i.e., will not regenerate health, will not move or follow, will not sheath weapon when you do, will not have conversation menu, but will verbally respond to being healed. Using the console kill command seems to fix his or her state without actually killing him or her. ? This has the same fixes as not leaving the recovery state, above. You can move distant objects by holding the Use button while giving orders to a follower. You can have more than one follower at a time with the Dawnguard add-on. If you have the Dark Brotherhood Initiate as a follower when you recruit Serana you may keep both followers. You may then be able to have a Housecarl follow you as a third follower unless you have Cicero and Serana. Sometimes, you are able to get more than one follower. To do this, have your original follower, and your potential second follower stand next to each other. Next, dismiss your follower, then immediately re-hire them. Exit out of their text, then quickly open conversation with your potential follower. If done correctly, you will be able to hire them. Do this as many times as you like by repeating the steps with your original follower. This may take a couple tries, you have to be quick. (needs confirmation on PC and Playstation) Confirmed possible to recruit the two Dark Brotherhood initiates with Cicero and a fourth companion on the Switch. First bring your usual follower into the Dark Brotherhood sanctuary and tell him/her to stand next to the two initiates. Dismiss your follower, then immediately recruit him/her. QUICKLY chat with the first initiate and then the second. Rinse and repoeat with Cicero. A quick workaround this issue is to use console command, select the follower in question and type addfac/addtofaction 0005C84D 1. This will not entirely restore the follower's dialogue and script but it will allow you to recruit followers if needed. This page was last modified on 27 March 2019, at 11:55.